In this 1918 photograph, influenza victims crowd into an emergency hospital at Camp Funston, a subdivision of Fort Riley in Kansas. Photo courtesy of the National Museum of Health/Associated Press. Public health policies—like immigration policies—were colored by eugenics. It was common for privileged elites to look down on workers and the poor as inferior categories of human being, whose natural degeneracy predisposed them to disease and deformity. It didn’t occur to those elites to look for the causes of illness in the often abject living conditions of the lower classes: crowded tenements, long working hours, poor diet. If they sickened and died from typhus, cholera, and other killer diseases, the eugenicists argued, then it was their own fault, because they lacked the drive to achieve a better quality of life. In the context of an epidemic, public health generally referred to a suite of measures designed to protect those elites from the contaminating influence of the disease-ridden rabble. 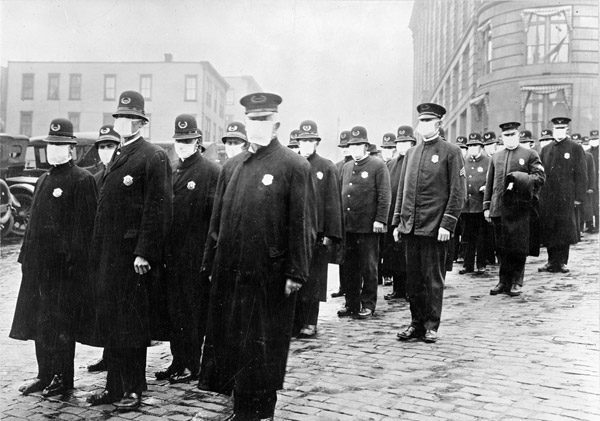 Policemen in Seattle wearing masks made by the Red Cross during the influenza epidemic, December 1918. Photo courtesy of the National Archives. 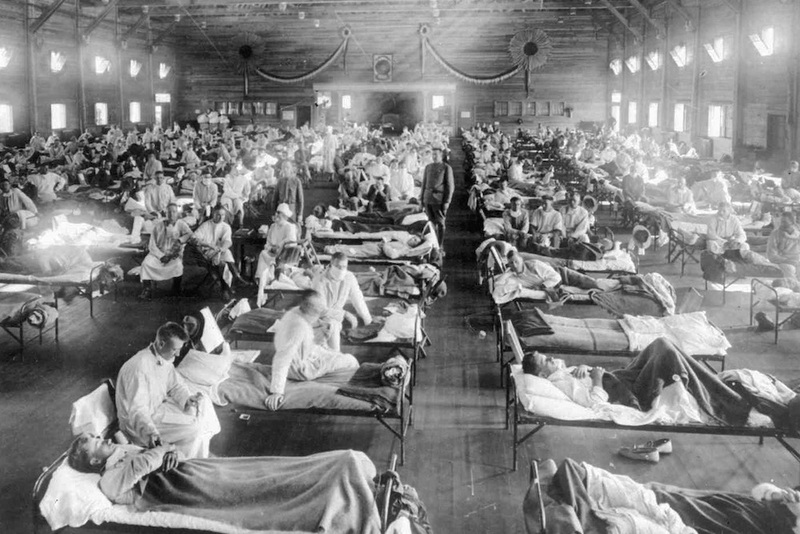 That first wave was relatively mild, not much worse than seasonal flu, but when the second and most deadly phase of the pandemic erupted in the autumn of 1918, people could hardly believe that it was the same disease. An alarmingly high proportion of patients died—25 times as many as in previous flu pandemics. Though initially they reported the classic symptoms of flu—fever, sore throat, headache—soon they were turning blue in the face, having difficulty breathing, even bleeding from their noses and mouths. If blue turned to black, they were unlikely to recover. Their congested lungs were simply too full of fluid to process air, and death usually followed within hours or days. The second wave receded towards the end of the year, but there was a third and final wave—intermediate in virulence between the other two—in early 1919. The disease claimed between 50 and 100 million lives, according to current estimates, or between 2.5 and 5 percent of the global population. To put those numbers in perspective, World War I killed about 18 million people, World War II about 60 million. Rates of sickness and death varied dramatically across the globe, for a host of complex reasons that epidemiologists have been studying ever since. In general, the less well-off suffered worst—though not for the reasons eugenicists proposed—but the elites were by no means spared. Privileged elites looked down on workers and the poor as inferior, … whose natural degeneracy predisposed them to disease. It didn’t occur to those elites to look for the causes of illness in the often abject living conditions of the lower classes: crowded tenements, long working hours, poor diet. The cornerstone of public health is epidemiology—the study of patterns, causes, and effects in disease—and this now received full recognition as a science. Epidemiology requires data, and the gathering of health data became more systematic. By 1925, for example, all U.S. states were participating in a national disease reporting system, and the early warning apparatus that had been so lamentably lacking in 1918 began to take shape. Ten years later, reflecting the authorities’ new interest in the population’s “baseline” health, U.S. citizens were subjected to the first national health survey. By the time the WHO came into existence, in 1946, eugenics had been disgraced and the new organization’s constitution enshrined a thoroughly egalitarian approach to health. It stated that, “The enjoyment of the highest attainable standard of health is one of the fundamental rights of every human being without distinction of race, religion, political belief, economic or social condition.” That philosophy wouldn’t eliminate the threat of flu pandemics—the WHO has known three in its lifetime, and will surely know more—but it would transform the way human beings confronted them. And it was born of an understanding that pandemics are a social, not an individual problem. Laura Spinney is a science journalist and novelist based in Paris.